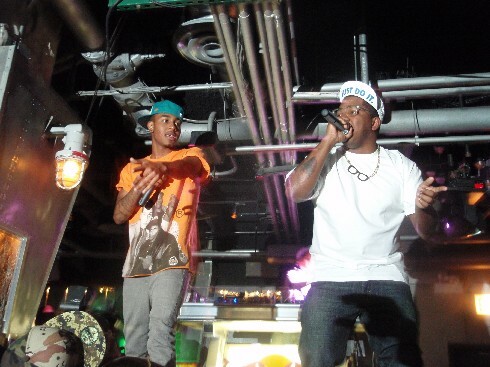 A couple weeks ago I went to see one of Chicago’s up and coming rap duos, The Cool Kids at Underground. Today they release their debut EP, The Bake Sale (C.A.K.E./Chocolate Industries) featuring their hit song “Black Mags”, a tribute to BMX-biking. If you like hip hop, I highly recommend that you pick up a copy. Mickey Rocks (aka Antoine Reed), 20, and Chuck Inglish (aka Evan Ingersoll), 23, rocked the crowd at Underground with their signature sound, a contemporary version of throwback 80’s with prominent beats and catchy commentary similar to the likes of the Beastie Boys and Run-DMC with a touch of Pharrell. Their sound has been praised by the Chicago Reader for “a Chicago specific hip-hop sound rivalin g that of the Dirty South, or Bay Area”. The duo met in 2005 through Myspace after Mickey came across Chuck’s beats online. Thanks to the internet, their music has quickly spread from the underground scene to landing major creds booking notable music festivals including the upcoming Lollapalooza and Rock the Bells, touring with rap star M.I.A, and callabos with A-trac (Kanye West’s DJ), Flosstradamus, and Lil’ Wayne on “Gettin’ It”. Not to mention, they were featured in Rolling Stone as one of the “Top 10 Artists to Watch in 2008”. In my opinion, part of what makes them “the whole package” is their down to earth swagger and “tell it like it is” attitude. Most impressively, they have their style down to a T with a fresh take on vintage street wear. Mark my words — this duo is soon to be added to the Chicago hip-hop hotlist of Kanye, Common, Lupe — just you wait. Besides checking out The Bake Sale, you can catch them for a performance at the Abbey Pub, this Wednesday, May 21st at 9 p.m. for a Darfur Now Benefit (suggested donation at the door).